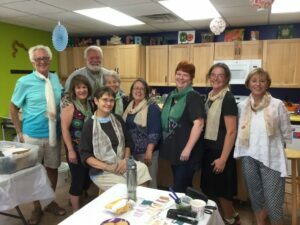 Eco Dyed & Printed Scarves - Winter Palette - Land O' Lakes Area Artisans, Inc.
explore the winter palette in natural materials and natural dyes to create your own work of art on a scarf. Join artist, Debbie Jircik and explore natural materials with a winter color palette for dyeing and printing. Each student will create a naturally dyed silk scarf. Optional: At class, students may pay the instructor, $25.00 for an additional 100% wool scarf that will be dyed and printed in class. At registration, please let us know if you would like a wool scarf. Discover plant materials cultivated, gathered from the wild, and remnants from the farmers market/produce aisle that create color as we experience dyeing on silk. Think in terms of muted earthy tones in a range of colors. Using a contact printing method, experiment with pattern made by leaves. Leave the class with an eco-printed and dyed silk scarf and sampler swatches of silk to use as a reference or in other projects, a resource guide, and enough knowledge to continue experimenting on your own. All levels welcome! Eagle River, clay & paper artist, gardener, & food advocate – Debbie Jircik, will share her passions for working with natural & environmentally friendly materials with LOLA students. No refunds will be given after the deadline date.